1989. Yale. Hard Cover. Book-VG. DJ-VG, slight edgewear. 9.5x6. 163pp. No date (c. 1989). Yale University Press. Hard Cover. Book-VG. DJ-VG. 9.5x6.5. 163pp. Very Good. 0300046626 Crisp, clean, unread book with some shelfwear-NICE. Yale University Press 1989. Unless Listed in this decription, VG or Better. Very Good in Very Good jacket. Book Light scuffs and soils on DJ; slight bow in front board. 163 pages. Fine. 0300046626 Crisp pages and tight binding. Light shelf wear on dust jacket. Light sun fading. Near Fine in Near Fine Dust Jacket. Near Fine in Near Fine Dust Jacket. "In each chapter of this book, a well-known person from the world of arts and letters recalls a memorable encounter with another famous individual who is no longer living. " [from the jacket]. 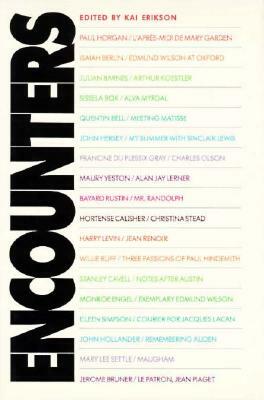 Some of the writers included are Isaiah Berlin, John Hersey, and Mary Lee Settle. Chapters were originally commissioned for and published in the Yale Review.. Very Good in Very Good jacket. 8vo-over 7¾"-9¾" tall. xv, 163 pp. Light foxing to page edges. Light creasing to jacket at upper and lower edges. Eighteen word-pictures by and about some of the notable figures of our time.